I’ve made some major changes to members’ Legacy Library pages, bringing this wonderful member project—the private libraries of over 100 readers from the past—closer than ever before. It has never been easier to compare the reading of Jefferson and Adams (427 books! ), Hemmingway and Fitzgerald. And is has never before been possible to compare that of Tupac Shakur and LibraryThing’s Australian systems administrator John Dalton! You can get it book-by-book, instead of person-by-person. From that, you can now see the top shared books across the Legacy Libraries, with you or any subset. The top books list is somewhat surprising. I’ve pasted it on the right, with the titles blacked out. See if you can guess number one. For combination reasons it’s not the Bible, but it’s probably not any of the others that leap immediately to mind. 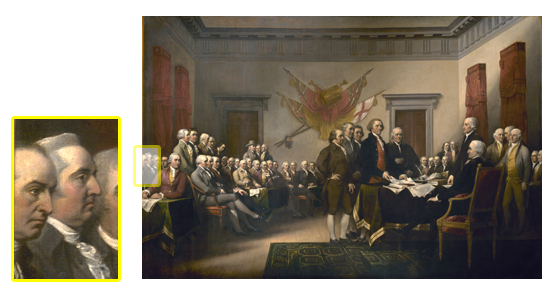 The top books between signers of the Declaration of Independence is also quite surprising. And why on earth did three American presidents bother to acquire General view of the agriculture in the county of Somerset?! The libraries are broken down into groups, so you can see what you share with actors, musicians, politicians, etc. Among these are the splinter project, the Libraries of Early America, which Jeremy, the Legacy Library project leader, is working on in collaboration with archives, libraries and museums across the country. You can filter everything in all sorts of clever ways. Later today I’ll push out a podcast I did with Jeremy, a long but enjoyable romp through the legacy libraries, cataloging, the meaning of books through history and book-love generally. As LT’s Legacy Libraries project continues to expand in scope (21 libraries have now been completed, with 27 more underway) and visibility (see Tim’s blog-post from Wednesday and this Talk thread), we’re always looking for a few good volunteers to assist in the various cataloging efforts. One of the most impressive things about these projects is the way people have come together to bring these fascinating collections into LT, creating a vibrant bibliosphere by making connections between books and their readers across time and space in new and really exciting ways. There are a wide variety of open projects that could use some assistance, which I’ve listed below with contact info for the applicable ‘project managers.’ If you’d like to help out with any project, drop them (or me) a profile-message and we’ll provide you with all the necessary background and info. You can be as active as you like, there’s no need for a major time commitment (unless you’re so inclined, of course!). Benjamin Franklin – See the LT group; contact Katya0133 or pdxwoman. Carl Sandburg – Contact KCGordon. Sir Walter Scott – Contact thorold. B.H. Liddell-Hart – Contact jmnlman or donogh. W.B. Yeats – See this Talk thread. Theodore Dreiser – Contact brandonw. John Dee – Contact jbd1. Willa Cather – See the LT group. William Congreve – See this Talk thread; contact prosfilaes. Even beyond these, there are a small number of projects which are currently quiet; if you’re interested in picking up where others left off, contact me and we’ll get that set up. Anyone should also feel free to add to the list of proposed libraries on the project wiki, and if you’re interested in starting a project, just follow the steps outlined in the Cataloging Guide or contact me for additional info on getting underway. Couldn’t say it better myself. But don’t take our word for it – jump in and see for yourself!